Tipping a nod to Plastic Warrior magazine and their Airfix special for the codes and to the Editor - Paul Morehead - for the original ID, wherein lies a tale we'll get to in a minute, but first a look at the machines and their riders. A heavily painted machine, and the first I found, although not the first I'd seen, pretty standard 54mm/1:32nd scale compatible machine. Not knowing much about motorbikes I can only obseve that it's not a 'V-twin' although what that makes it instead is up for grabs, and the knee-pads on the tank look a bit like some BSA ones? Comparison with an unpainted machine, the pink one I will wax-lyrical on in a minute, but for now you can see how it's quite a detailed machine for its age compared with the machines posted on the Home Blog today (5th November 2018) where Pyro, Teixedo, Reisler and later Atlantic were producing machines with hinted-at engine detail, or imaginary engines! 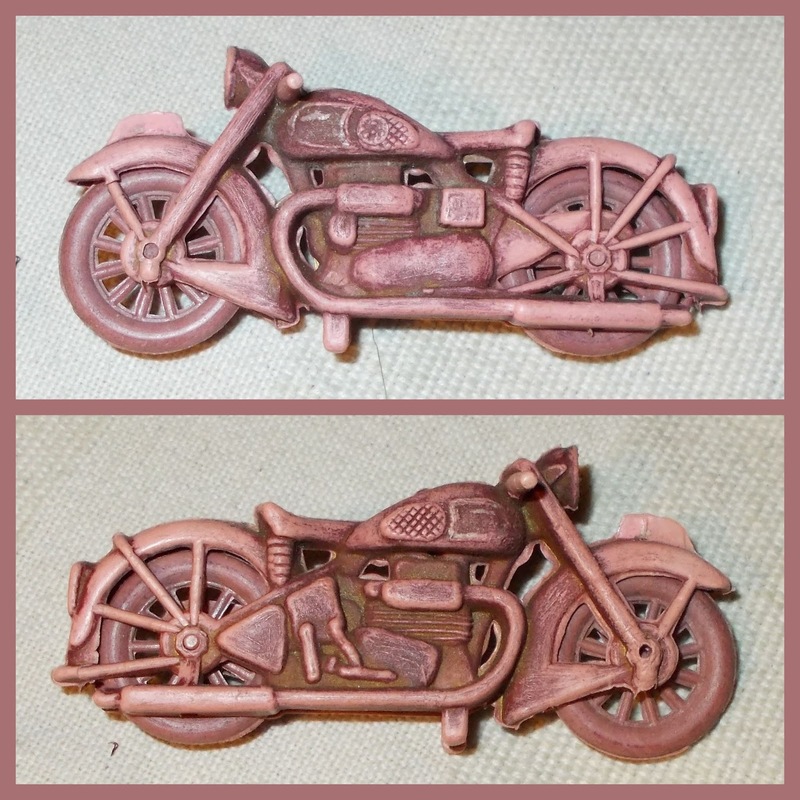 500 - Motorbikes & Riders (2 types). 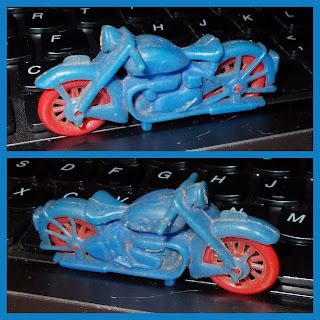 Unpainted only . . all unbreakable and removable riders. What any retailer would want a gross (144) of motorcycles riders [without bikes] for is anyone's guess! 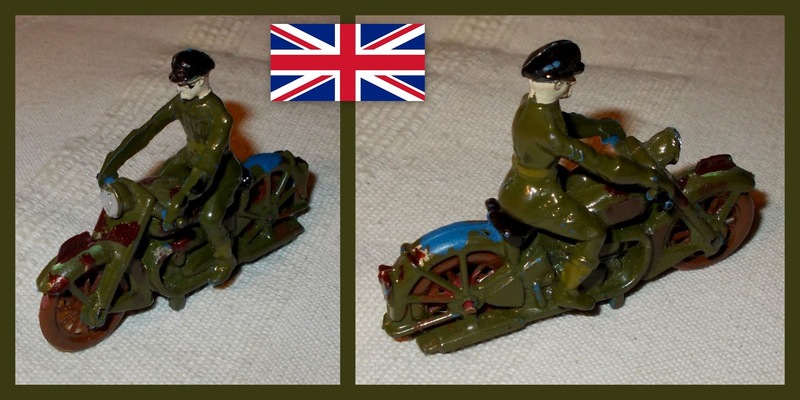 Another, with one of the riders, this is the helmeted chap, the other has a peaked 'service-cap', of a rather squishy US style, but I'm not aware of this being a US mould-share or copy and the machine is very British in lines. The listing given in PW's special is from an un-dated 1940's catalogue and it's not clear which rider is 501 and which is 502, but I favour this as the '2, due to seniority, the other figure having sergeants stripes! So, to the sorry tale . . . Anyway, JB asked me if I could clean them, and I said "Yeah, sure, I'll take them home and do it tonight". I can tell you it took three dips in Nitromores (this back in the day when Nitromores would take the paint off a car-body in 30 seconds and was worth using - now it's some 'elf-n-safety' affected, watered down, oven-polish with no power to speak of! ), and a hour or so with a tooth-pick to get the thick khaki 'mud' off them. Then, about four/five years later, I found this at Dave McKenna's Birmingham show! I've since seen others and although the catalogue in PW states "unpainted", and while most examples are unpainted, it looks like either Airfix or a retailer painted them at some point, with this thick gloss paint, and that we'd stripped 'factory-paint' off a whole batch! Hey-ho! As the paint matches some examples of the early mounted (Horse Guard in service dress) and early 54mm figures (Airborne, Japanese and Paratrooper), I think it probably was/is Airfix? Three parts of the bike and both riders, as [unpainted] riders are usually a different colour to wheels/motorcycle, the fact that the painted one is the same colour as the bike he came with is another sign that they were probably factory-/out-painted and then matched to machines with the under-polymer colours unknown. There is a variation of the helmeted figure, with his goggles on his helmet, not his face, with the same pocketed tunic as the Sergeant and without the Sam-Brown/cross-belt, whether this was dropped early or added after the PW-referenced catalogue is unknown. Equally it may be that someone forgot to include it in the catalogue listing, OR that the 'two types' are cap or helmet and that there was 'artistic' variance within a multiple-cavity mould/tool? My sample to-date (Nov.'18), whatever the truth of the paint/no paint, I'm not stripping my one; just in case! But the one I really like is the pink one . . .
. . . and I can't tell you how much I love this toy - it looks like a fossil, dug from the pink sandstones of the Gobi desert, painstakingly, with a hat-pin and a soft-brush. 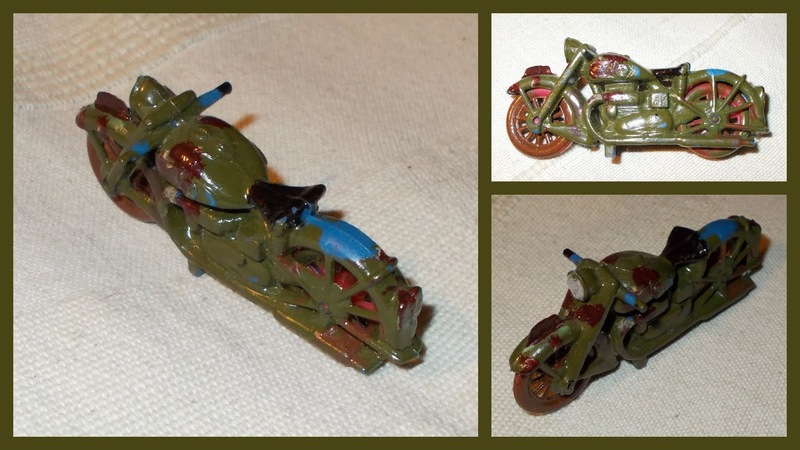 By some series of quirks, from the similarly-coloured plastic for the wheels and bike, some factory or home painting at various times, some cleaning and/or weathering/play-wear over time, it has developed a patina of 'antiqued' age you couldn't re-produce in a laboratory with the greatest minds in the universe working on the problem. This is one of the ten to try and save from a fire! If it wasn't identical to the others in every way, you'd think it was from another company and thirty-year's earlier! 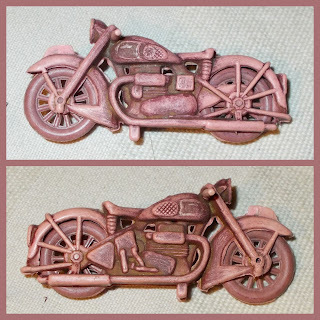 Under the patina, the bike is a pale pinky-flesh and the wheels a mauve-purple. The engine seems to have been gold at some point and the patina is probably a sign of the vehicle having been a darker-red with an unstable additive/colourant? 10th Dec. 2018 - Strangely (not! They're always following me!) a machine turned-up in Vichy over the weekend - a month after posting this - with traces of all-over gold paint! Signs of the front number-plate being painted on the faded one, and a short-shot / miss-mould on the front number-plate of the red one, I also noticed the mud-guard bar on the blue one has gawn-missin'. . . I'll trim it off to make it less obvious at a glance! A few more riders, all the same pose, they came together, so probably date from the same factory-gate batch, a later (?) stable pigment ethylene run, matching two of my machines, the red and silver exactly, the black a new colour. The original image I used in a mixed motorbike post on the 'Home Blog' when I was hedging my bets with a 'probably/possibly' I think! Other colours seen in relation to these include a bright apple/grass green and a subdued yellow. So - I got them out and took the shot a few days later, but I'm not going to announce it on the home Blog, as I've posted a couple of links there (to here) in the last few weeks and I'm sure some people get sick of links to something they've only just read! Therefore if you're reading this in December 2018 you're getting a 'sneak preview' of something I won't return to until something more substantial turns-up! Not that there's' anything new in it, just a nice picture!